The prince-electors (or simply electors) of the Holy Roman Empire (German: Kurfürst Latin: Princeps Elector) were the members of the electoral college of the Holy Roman Empire, having since the 13th century the privilege of electing the King of the Romans or, from the middle of the 16th century onwards, directly the Holy Roman Emperor. The heir-apparent to a lay prince-elector was known as an electoral prince (German: Kurprinz). The dignity of Elector carried great prestige and was second only to King or Emperor. 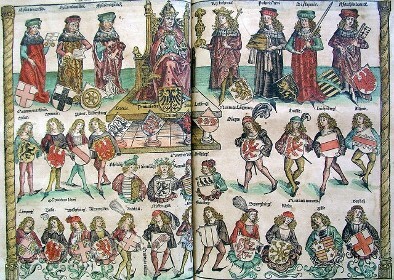 The Holy Roman Empire was in theory an elective monarchy, but from the 15th century onwards the electors often merely formalised what was a de facto dynastic succession within the Austrian House of Habsburg, with the title usually passing to the eldest surviving son of the deceased Emperor. Despite this, the office was not legally hereditary, and the heir could not title himself "Emperor" without having been personally elected. Formally the Prince-Electors elected a King of the Romans, who was elected in Germany but became Holy Roman Emperor only when crowned by the Pope. Charles V was the last to be a crowned Emperor (elected 1519, crowned 1530); his successors were all Emperors by election only, each titled "Emperor-elect of the Romans" (German: erwählter Römischer Kaiser; Latin: electus Romanorum imperator). Electors were among the princes of the Empire, but they had exclusive privileges in addition to their electoral ones which were not shared with the other princes. The dignity of Elector was extremely prestigious, and was held in addition to such feudal titles as Duke, Margrave, or Count Palatine. At least from the 13th century, there were seven electors: three spiritual (the Archbishop of Mainz, the Archbishop of Trier, and the Archbishop of Cologne) and four lay: (the King of Bohemia, the Count Palatine of the Rhine, the Duke of Saxony, and the Margrave of Brandenburg; these last three were also known as the Elector Palatine, the Elector of Saxony, and the Elector of Brandenburg, respectively). 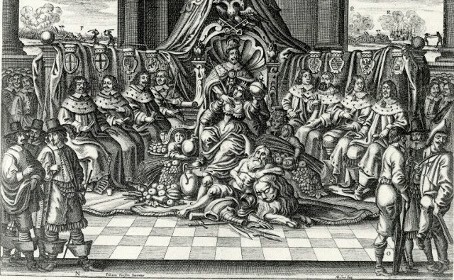 Only six of the electors, however, had the right to sit at ordinary meetings: "The King of Bohemia, who was in fact not a prince of the Empire but a neighbouring and independent monarch, might vote at an imperial election, but was allowed on no other occasion to meddle in the affairs of the Empire." Other electors were added in the 17th century, including the Duke of Bavaria (referred to as the Elector of Bavaria replacing the Count Palatine of the Rhine, who was of the same family but had lost his title and vote temporarily during the Thirty Years' War), and the Duke of Brunswick-Lüneburg (the Elector of Hanover - an office subsequently held by three Hanoverian kings of Great Britain, George I, George II, and George III). Several new electors were created during the reorganization of the Empire in 1803, but these never participated in an election. On August 6, 1806, pressed both by Napoleon and by several German princes (including some Electors), the last Holy Roman emperor, Emperor Francis II, by edict dissolved the Empire. After or just before the dissolution, the Electors of Bavaria, Württemberg, Saxony, and Hanover each took the title of king of his former electorate (in the case of Hanover after regaining his lands following Napoleon's defeat in 1814) while the King of Prussia extended his royal title to cover his erstwhile Electorate of Brandenburg as well as the lands he held as king outside the imperial border. The Electors of Regensburg (who had succeeded to the Mainz vote), Würzburg (who had succeeded to the Salzburg vote), and Baden (a new electorate) became grand dukes. The Elector of Hesse and Landgrave of Hesse-Kassel chose to retain the defunct electoral title until the state was annexed by Prussia, 60 years later. Etymology of Kurfürst - The German element Kur- is based on the Middle High German irregular verb kiesen and is related etymologically to the English word choose (cf. Old English ceosan [t?eo?zan], participle coren 'having been chosen' and Gothic kiusan). In English, the "s"/"r" mix in the Germanic verb conjugation has been regularized to "s" throughout, while German retains the r in Kur-. There is also a modern German verb küren which means 'to choose' in a ceremonial sense. Fürst is German for 'prince', but while the German language distinguishes between the head of a principality (der Fürst) and the son of a monarch (der Prinz), English uses prince for both concepts. Fürst itself is related to English first and is thus the 'foremost' person in his realm. Note that 'prince' derives from Latin princeps, which carried the same meaning. The German practice of electing monarchs began when ancient Germanic tribes formed ad hoc coalitions and elected the leaders thereof. Elections were irregularly held by the Franks, whose successor states include France and Germany. The French monarchy eventually became hereditary, but the German monarchy remained elective. While all free men originally exercised the right to vote in such elections, suffrage eventually came to be limited to the leading men of the realm. In the election of Lothar II in 1125, a small number of eminent nobles chose the monarch and then submitted him to the remaining magnates for their approbation. Soon, the right to choose the monarch was settled on an exclusive group of princes, and the procedure of seeking the approval of the remaining nobles was abandoned. The college of electors was mentioned in 1152 and again in 1198. 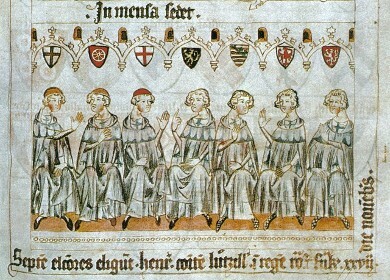 A letter of Pope Urban IV suggests that by "immemorial custom", seven princes had the right to elect the King and future Emperor. These were three ecclesiastic: the Archbishop of Mainz, the Archbishop of Trier, Archbishop of Cologne and four secular: the King of Bohemia (král ?eský, König von Böhmen), the Count Palatine of the Rhine (Pfalzgraf bei Rhein), the Duke of Saxony (Herzog von Sachsen) and the Margrave of Brandenburg (Markgraf von Brandenburg). The seven have been mentioned as the vote-casters in the election of 1257 that resulted in two kings becoming elected. The three Archbishops oversaw the most venerable and powerful sees in Germany, while the other four were supposed to represent the dukes of the four nations (the Franks, Swabians, Saxons and Bavarians); they also hold great offices in the imperial household. The dukedoms of Franconia and Swabia had become extinct; their place and power, and the household offices they held, descended to the County Palatine of the Rhine and the Margraviate of Brandenburg. Saxony, even with diminished territory, retained its eminent position. The Palatinate and Bavaria were originally held by the same individual, but in 1253, they were divided between two members of the House of Wittelsbach. The other electors refused to allow two princes from the same dynasty to have electoral rights, so a heated rivalry arose between the Count Palatine and the Duke of Bavaria. Meanwhile, the King of Bohemia, who held the ancient imperial office of Arch-Cupbearer, asserted his right to participate in elections. Sometimes he was challenged on the grounds that his kingdom was not German, though usually he was recognized, instead of Bavaria which after all was just a younger line of Wittelsbachs. The college's composition remained unchanged until the 17th century, although in 1547, in the aftermath of the Schmalkaldic War, the Saxon electorship was transferred from the senior to the junior branch of the Wettin family. In 1621, the Elector Palatine, Frederick V, came under the imperial ban after participating in the Bohemian Revolt (a part of the Thirty Years' War). The Elector Palatine's seat was conferred on the Duke of Bavaria, the head of a junior branch of his family. Originally, the Duke held the electorate personally, but it was later made hereditary along with the duchy. When the Thirty Years' War concluded with the Treaty of Münster (also called the Peace of Westphalia) in 1648, a new electorate was created for the Count Palatine of the Rhine. Since the Elector of Bavaria retained his seat, the number of electors increased to eight; the two Wittelsbach lines now sufficiently estranged so as not to pose a combined potential threat. 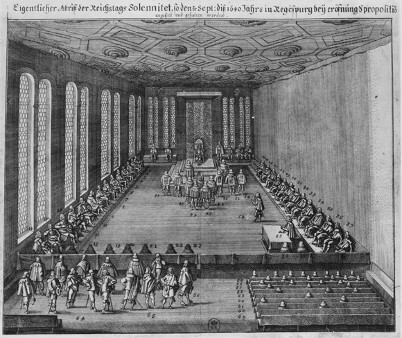 In 1692, as a result of the inheritance of the Palatinate by a Catholic branch of the Wittelsbach family, which threatened to upset the religious balance of the College of Electors, the number of electors was increased to nine, with a seat being granted to the Duke of Brunswick-Lüneburg, who became known as the Elector of Hanover (the Imperial Diet officially confirmed the creation in 1708). In 1706, the Elector of Bavaria and Archbishop of Cologne were banned during the War of the Spanish Succession, but both were restored in 1714 after the Peace of Baden. In 1777, the number of electors was reduced to eight when the Elector Palatine inherited Bavaria. Many changes to the composition of the college were necessitated by Napoleon's aggression during the early 19th century. The Treaty of Lunéville (1801), which ceded territory on the Rhine's left bank to France, led to the abolition of the archbishoprics of Trier and Cologne, and the transfer of the remaining spiritual Elector from Mainz to Regensburg. In 1803, electorates were created for the Duke of Württemberg, the Margrave of Baden, the Landgrave of Hesse-Kassel (or Hesse-Cassel), and the Duke of Salzburg, bringing the total number of electors to ten. When Austria annexed Salzburg under the Treaty of Pressburg (1805), the Duke of Salzburg moved to the Grand Duchy of Würzburg and retained his electorate. None of the new electors, however, had an opportunity to cast votes, as the Holy Roman Empire was abolished in 1806, and the new electorates were never confirmed by the Emperor. Electors were reichsstände (Imperial Estates), enjoying precedence over the other princes. They were, until the 18th century, exclusively entitled to be addressed with the title Durchlaucht (Serene Highness). In 1742, the electors became entitled to the superlative Durchläuchtigste (Most Serene Highness), while other princes were promoted to Durchlaucht. As Imperial Estates, the electors enjoyed all the privileges of the other princes enjoying that status, including the right to enter into alliances, autonomy in relation to dynastic affairs and precedence over other subjects. The Golden Bull had granted them the Privilegium de non appellando, which prevented their subjects from lodging an appeal to a higher Imperial court. However, while this privilege, and some others, were automatically granted to Electors, they were not exclusive to them and many of the larger Imperial Estates were also to be individually granted some or all those rights and privileges. After the abolition of the Holy Roman Empire in August 1806, the electors continued to reign over their territories, many of them taking higher titles. The Dukes of Bavaria, Württemberg, and Saxony made themselves Kings, as later did the Duke of Brunswick-Lüneburg, who was already King of Great Britain. Meanwhile, the Margrave of Baden elevated himself to the Grand-Ducal dignity. The Landgrave of Hesse-Kassel, however, retained the meaningless title "Elector of Hesse", thus distinguishing himself from other Hessian princes (the Grand Duke of Hesse-Darmstadt and the Landgrave of Hesse-Homburg). Napoleon soon exiled him and Kassel was annexed to the Kingdom of Westphalia, a new creation. The Congress of Vienna accepted that all old secular electorates were entitled to be kingdoms, but generally did not want to accept kingship for new, Napoleon-era electorates. This was one reason why Hanover became a kingdom. Württemberg, already having adopted royal rank in Napoleon era, was ultimately not stripped of it. Baden did not even try. But the restored elector of Hesse (a new electorate) tried to get recognition to title of king (King of Chatti), and was unsuccessful in that pursuit. They being not willing to give up the electoral rank, this led to the situation that this principality, which never cast an electoral vote in any imperial election, was the one which preserved the title of prince-elector. In 1866, however, the last Elector of Hesse was dethroned under Otto von Bismarck's plan for German Unification. The individual chosen by the electors assumed the title "King of the Romans", though he actually reigned in Germany. The King of the Romans became Holy Roman Emperor only when crowned by the Pope. On many occasions, a Pope refused to crown a king with whom he was engaged in a dispute, but a lack of a papal coronation deprived a king of only the title Emperor and not of the power to govern (cf Declaration of Rhens). The Habsburg dynasty stopped the practice of papal coronations. After Charles V, all individuals chosen by the electors were merely "Emperors elect". The electors were originally summoned by the Archbishop of Mainz within one month of an Emperor's death, and met within three months of being summoned. During the interregnum, imperial power was exercised by two imperial vicars. Each vicar, in the words of the Golden Bull, was "the administrator of the empire itself, with the power of passing judgments, of presenting to ecclesiastical benefices, of collecting returns and revenues and investing with fiefs, of receiving oaths of fealty for and in the name of the holy empire". The Elector of Saxony was vicar in areas operating under Saxon law (Saxony, Westphalia, Hanover, and northern Germany), while the Elector Palatine was vicar in the remainder of the Empire (Franconia, Swabia, the Rhine, and southern Germany). The Elector of Bavaria replaced the Elector Palatine in 1623, but when the latter was granted a new electorate in 1648, there was a dispute between the two as to which was vicar. In 1659, both purported to act as vicar, but the other vicar recognised the Elector of Bavaria. Later, the two electors made a pact to act as joint vicars, but the Imperial Diet rejected the agreement. In 1711, while the Elector of Bavaria was under the ban of the Empire, the Elector Palatine again acted as vicar, but his cousin was restored to his position upon his restoration three years later. Finally, in 1745, the two agreed to alternate as vicars, with Bavaria starting first. This arrangement was upheld by the Imperial Diet in 1752. In 1777 the question became moot when the Elector Palatine inherited Bavaria. On many occasions, however, there was no interregnum, as a new king had been elected during the lifetime of the previous Emperor. In the 10th and 11th centuries, princes often acted merely to confirm hereditary succession in the Saxon (Ottonian) and Franconian (Salian) dynasties, whereas beginning from the actual forming of the prince-elector class, elections became less secure (with the election of 1125), though the Staufen dynasty managed to get its sons formally elected in their fathers' lifetimes almost as a formality. After these lines ended in extinction, the electors began to elect kings from different families so that the throne would not once again settle within a single dynasty. For some two centuries, the monarchy was elective both in theory and in practice; the arrangement, however, did not last, since the powerful House of Habsburg managed to secure succession within their dynasty during the fifteenth century. All kings elected from 1438 onwards were from among the Habsburg Archdukes of Austria (and later Kings of Hungary and Bohemia) until 1740, when the archduchy was inherited by a woman, Maria Theresa. A representative of the House of Wittelsbach became elected for a short period of time, but in 1745, Maria Theresa's husband, Francis I of the Habsburg-Lorraine dynasty, became King; all of his successors were also from the same family. Hence, for the greater part of the Empire's history, the role of the electors was largely ceremonial. Each elector held a "High Office of the Empire" (Reichserzämter) and was a member of the (ceremonial) Imperial Household. The three spiritual electors were all Arch-Chancellors (German: Erzkanzler, Latin: archicancellarius): the Archbishop of Mainz was Arch-Chancellor of Germany, the Archbishop of Trier was Arch-Chancellor of Burgundy, and the Archbishop of Cologne was Arch-Chancellor of Italy. Many High Officers were entitled to use augmentations on their coats of arms; these augmentations, which were special marks of honour, appeared in the centre of the electors' shields (as shown in the image above) above the other charges (in heraldic terms, the augmentations appeared in the form of inescutcheons). The Arch-Steward used gules an orb Or (a gold orb on a red field). The Arch-Marshal utilised the more complicated per fess sable and argent, two swords in saltire gules (two red swords arranged in the form of a saltire, on a black and white field). The Arch-Chamberlain's augmentation was azure a sceptre palewise Or (a gold sceptre on a blue field), while the Arch-Treasurer's was gules the crown of Charlemagne Or (a gold crown on a red field). As noted above, the Elector Palatine and the Elector of Hanover styled themselves Arch-Treasurer from 1714 until 1777; during this time, both electors used the corresponding augmentations. The three Arch-Chancellors and the Arch-Cupbearer did not use any augmentations.